The Assembly Committee responsible for scrutiny of the First Minister, Carwyn Jones, will examine the approach to reducing poverty in Wales and other issues in the West Wales region. The First Minister Carwyn Jones will be appearing before the Committee for the Scrutiny of the First Minister on Friday, 17 February at 11.00 in the Halliwell Centre, Carmarthen. The Assembly has several committees made up of Assembly Members from different political parties to look at different subjects in detail, i.e. health, education and culture. One of their functions is to investigate whether the Welsh Government is doing a good job. They do this by asking for views from the public and by getting input from experts, charities and other organisations. They also regularly question Welsh Government Cabinet Secretaries and Ministers. The Committee for the Scrutiny of the First of the Minister meets once a term and (as the name suggests) looks specifically at what the First Minister is doing. The chair of the Committee is the Deputy Presiding Officer Ann Jones AM. All of the Assembly Members in this committee are also currently chairs of other committees. staffing of the Welsh Government. What will the Committee be discussing this time? For this meeting the Committee will be focusing on the Welsh Government’s vision and approach to reducing poverty in Wales. Read more about the issue. The Committee would also like to discuss other major issues in the West Wales region. If you have an issue you’d like to raise, you can suggest a topic in advance. You are welcome to come and watch the Committee proceedings in person. Let us know via our booking line. If you are local to Carmarthen or live in the West Wales area you can also suggest topics for discussion in advance. If you can’t make it in person, the meeting will be available to watch very soon afterwards on Senedd.TV. On Thursday May 24, members of a National Assembly for Wales committee held an open mic event in Stebonheath, Llanelli, to listen to people’s views on the Welsh Premier League. 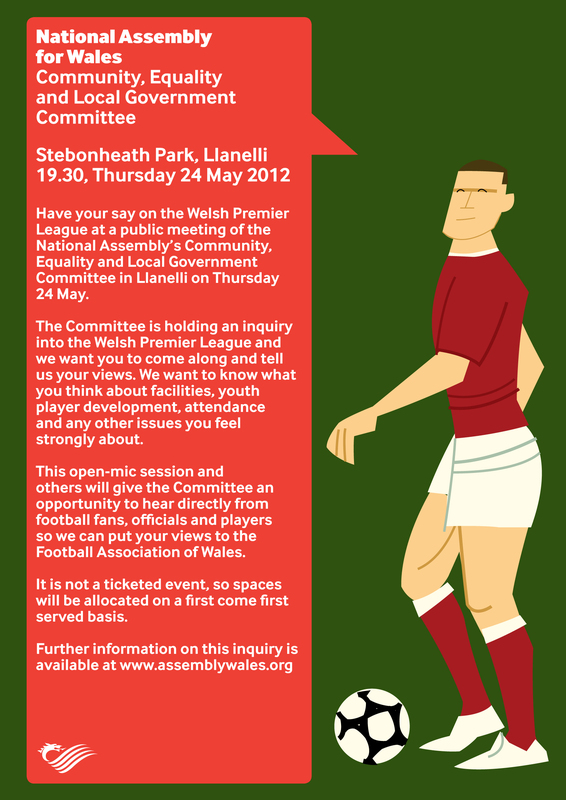 The event was part of the Community, Equality and Local Government Committee inquiry into the Welsh Premier League. Ann Jones, chair of the Committee said after the event: “it was great to get out and meet people who are interested in the Welsh Premier League and are dedicated to making it, and their clubs successful. We heard a number of important points about how the Welsh Premier League can be developed and we will be putting these points to the Welsh Football Association when they come to speak to us in the Senedd. The video below includes videos with Colin Staples from the Welsh Football Trust, and Nigel Richards from Llanelli AFC, speaking about the main discussion points of the event. This week the Outreach Team linked up with Carmarthenshire Association of Voluntary Services to bring the Assembly Outreach Bus along to Llandeilo, giving delegates at their AGM the chance to learn about the National Assembly for Wales. A stand, staffed by the Outreach Manager for Mid and West Wales provided information on relevant current inquiries, including Residential Care Inquiry and the Learning and Skills (Wales) Measure. Meanwhile members of the public were able to visit the bus in the town centre and learn about the work of the Assembly. The National Assembly for Wales is currently designing their Equality Plan and members of the Equality Team were on board asking people to participate in their Strategic Equality Plan consultation.